Prepare the operating room by creating a sterile environment. Set up the tools and equipment. Help the doctors and nurses change into their operating garments. Handle equipment, watch the monitors, and position the patient during active surgery. Maintain a sterile environment necessary for surgeries. Clean the operating room and replace the equipment used, store the equipment, and shut down the operating room, leaving it ready to go for the next operation. Bandage the patient post surgery. You’ll work alongside the anesthesiologist, circulation nurse, registered nurses, and the surgeon. But basically, the surgeon will be your boss, unless otherwise stated either through state or hospital regulations. If you’re in high school right now, and you’re thinking about becoming a surgical technologist, then you can get a head start by taking loads of science classes, computer technology, and basic math like algebra and geometry. These types of courses will leave you prepared for the college or trade school curriculum you’ll be doing. Find a surgical technology school. Have your high school diploma or GED. Have a 2.5 high school grade point average, which is the minimum most surgical tech programs accept. Get your certificate or diploma from your accredited surgical technology program. Diploma programs take about one year to complete, full time. You’ll need 37-49 course credits to graduate. Associate degree programs take two years if you’re attending full time. There are 32 gen-ed credits and 60 core credits. Programs should be accredited by the Commission on Accreditation of Allied Health Education Programs (CAAHEP). An accredited program may not be a prerequisite to getting a job as a surgical technologist, but going through one is necessary to get certifications. Certifications are available, and optional. However, it’s only going to help you find a job. 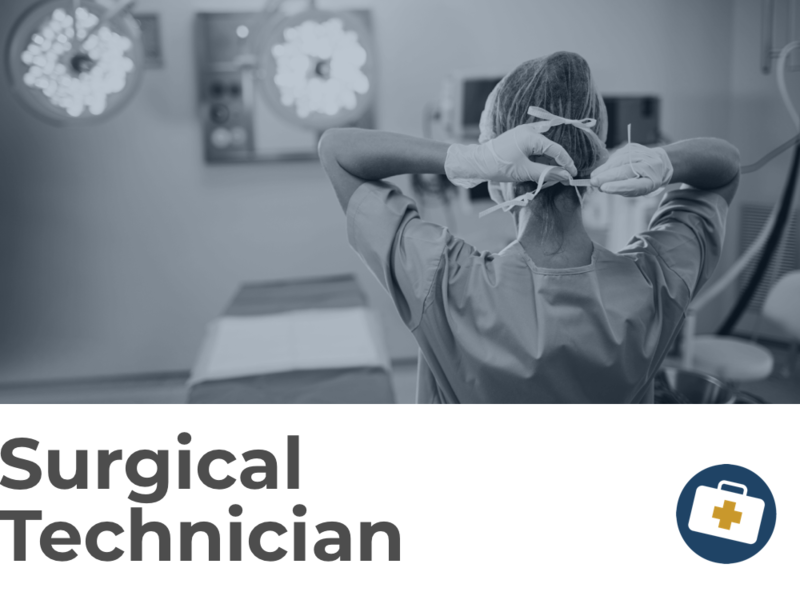 Certifications are available from the National Center for Competency Testing and the National Board of Surgical Technology and Surgical Assisting. Continuing education is needed to maintain your certifications. CPR and Basic Life Support certifications are necessary. You can advance your career by becoming a registered nurse. Or, you can choose to teach health services in a trade school or community college. The lowest ten percent of surgical teach make in the vicinity of $32K. The median salary for surgical techs more than $46K, and the top 10 percent of your colleagues are earning $67K annually. You’ll find that the highest paying industries are outpatient centers, doctors' offices, and hospitals, which pay a bit above or right around that median salary. If you’re working in a hospital, expect irregular hours with nights, weekends, and holidays on the schedule. Also, some of your shifts will be more than eight hours. Faster than average employment growth is projected for your chosen field. Which means, there will be in excess of 12,000 new jobs opening through 2026. As long as the program you’ve completed is accredited, and you go after those certifications, you should easily find yourself a job. What does a surgical tech do?